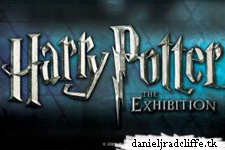 Via snitchseeker.com: the translation from the audio that they took at the press conference for Harry Potter: The Exhibition in New York this past Monday. The cast included Robbie Coltrane, Helen McCrory, David Barron, Freddie Stroma, David Thewlis and Warwick Davis. Like we all know Daniel couldn't be there himself. See the quotes below. SnitchSeeker: Since this is Harry Potter, and you’ve all worked with Dan Radcliffe, what’s your favorite scene or experience with him? Helen McCrory: He’s also got a great knowledge of music. Two Christmases ago I really decided I’ve got to stop listening to Stones and Dylan and try and lurch myself loose into the twentieth, if not twenty-first, century. He was fantastic and wrote lists and lists of brilliant albums, all of which my husband owns now, which was bought for Christmas presents. He’s a real music-head. He’s passionate. David Barron: He’s just fun and funny. She’s so interested in everything and everybody. He’s really brilliant. He’s a real leader on the set because he’s really motivated to make anybody who’s new, either in crew or cast terms, just made to feel comfortable and settle in as if they’re part of the family that had developed over the years. He’s a really, really impressive young man, but he’s also very funny – loves to joke around and loves a laugh. Freddie Stroma: I can completely agree with David. I came on late in the films. I can in for my first ever costume fitting and he introduced himself to me. Then I saw him again three weeks later and he came straight up to me, “Hi, Freddie, how are you doing?” He completely remembered my name. He meets hundreds of people all the time, constantly. He will still remember your name and everything. It’s really quite amazing. Just such a lovely guy. David Thewlis: I remember when we were doing the scene where he changes into [seven] different Harrys. The first AD (assistant director) snapped at him about something, or something wasn’t going right, and about 30 minutes later apologized. He said, “Sorry, Dan. It’s been a long week, so I really apologize” and Dan came straight back, saying, “It’s been a long adolescence, mate,” with an expletive in there, as well. Warwick Davis: I’d like to talk about Dan for a minute, Echoing what everyone said, his enthusiasm and energy is boundless, and really is infectious when you’re on the set, which is useful when you’re under four hours of prosthetic make up. You need somebody to give you a bit of a boost and increase your energy. Just remembering back, having worked with him on all of the films, Dan was very, very young, 9 or 10 when we started. I think I was taller than Daniel when we started. I remember filming the sequence in Gringott’s Bank. He came up to the counter and Chris Columbus was particularly keen for Dan to be a bit shocked when he first sees the goblin bank teller peering over the desk at him. He whispered to me before Dan’s close up, “When we get to this close up, as Dan approaches the bench, can you make some sort of scary noise and make him to jump so that we can get a shocked reaction?” I said, “That’ll be fine. I’ll sort that out.” I had all the face make up on, so that’d be no problem. So the cameras rolled. Chris shouted action. Dan walks up and I went, “BLAHHHH!” like that. Daniel just stood there for a second and then burst out laughing. It had completely the opposite effect than we’d desired. He’s just a brilliant lad to work with. He’s done so well. And just to have gotten through all these films and been so consistent, it’s quite an achievement, really. David Barron: It was growing up, too, that’s the other thing we all forget. Helen McCrory: And it’s also really nice to say it genuinely. So often we’ve made films and somebody’s like, ”What are they like to work with?” and you’re “Extraordinary individual” with a lot of subtext in that. The reality is you have to work with these people and then you have to lie about how enjoyable it was to work with these people. So it’s actually nice to not have to lie at all. Genuinely, he is a gentleman. Robbie Coltrane: There was never anything child actorish about any of those three. There is a sort of child actor to be avoided. David Barron: It’s the whole supporting cast, too. There isn’t anybody you wish wasn’t there, really. It was just extraordinary.